Why is our candy considered the best Salt Water Taffy ? As a 4th generation family business based out of the USA, we are dedicated to carrying on the delicious legacy that came before us. Through the years, we have been able to perfect and refine our taffy making process. Each piece of candy taffy comes from a hand-made batch process and Taffy Town is famous for its unique recipe, using egg whites to create a whipped nougat style taffy with a soft texture that melts in your mouth with the most delicious flavors. We strive for perfection in all our Candy Taffy and make sure we always have the best of flavors. Our goal is to provide the most flavorful, true to life varieties of soft, whipped style taffy you can find. We are always testing new flavors and adding them to our list and with 75 flavors and all kinds of different assortments you are sure to find a taffy that you love. New taffy flavors come out once per year with our Cookies & Cream flavor being new this year. Make sure you check out our Flavor Guide to find your favorites. Have a diet restriction that keeps you from eating the candy you love? Our business is committed to the candy excellence we started over 100 years ago, and we want everyone to be able to partake in our delicious taffy treats. We are proud to offer a completely nut, gluten & soy free taffy for all our flavors. Even our Peanut Butter and PB&J flavors are nut free! Our taffy is Kosher certified and comes in both regular and sugar free options. 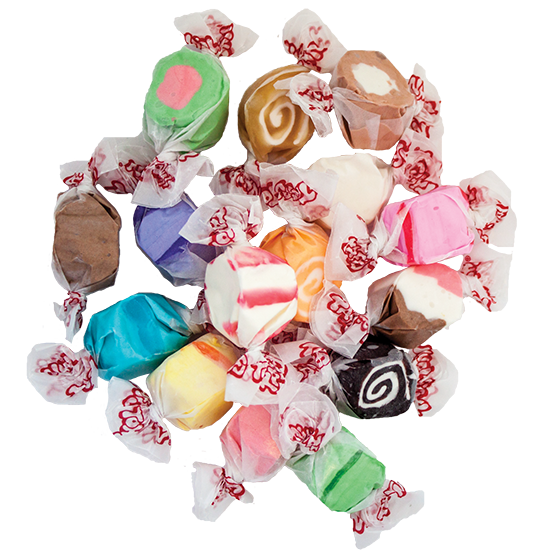 Are you a wholesaler looking to buy bulk Salt Water Taffy ? We are crazy about our taffy and want everyone to be able to partake in our candy. But we can’t do it alone! Did you know that you can buy in bulk to save on our delicious salt water taffy? Check out our most recent taffy brochure that gives you can idea of our bulk taffy options. Send us a message with your information and we would love to be able to assist you in selling our product. There is a 1 case minimum requirement, but that won’t be a problem once you and your customers get a taste for our delicious taffy. We are proud to serve a world-wide market of taffy lovers.